Ensure your outdoor electrical connections remain water tight and safely linked using this Allied Precision Black Clickshield Cord Connector. This durable and lasting accessory fully encases the male plug of your existing pond deicer or outdoor lights, as well as the female end of your extension cord. The dual cylinders each click closed, and an included gasket completes the unit. 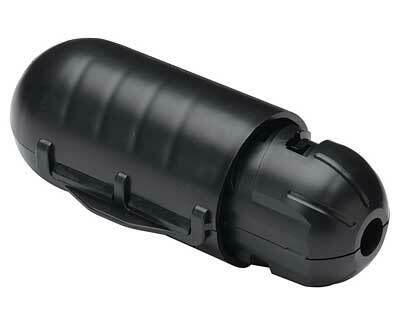 The reinforced plastic casing can hold a wealth of plug sizes, and ridges along the body help the item interlock. An opening at each end accommodates your cords, and the item's black color keeps it inconspicuous. Protect your outdoor electrical connections from the elements with this Black Clickshield Cord Connector.